Vinyl windows are an inexpensive alternative to traditional glass windows. The costs for adding vinyl windows to your screen room enclosure is substantially less than adding glass windows. 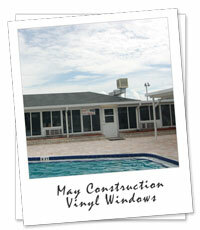 Most counties do not require electrical, additional concrete footers, or a permit when vinyl windows are installed. Springs, and all of Central Florida.